Creating a double increase with a make 1 adds a new stitch on either side of an existing center stitch. Make the increase symmetrical by twisting the m1 increase before the center stitch to the right and the m1 increase after the center stitch to the left. 1Work to the stitch marked for the increase. Simply knit as you normally would. 2Work an m1 that twists to the right. 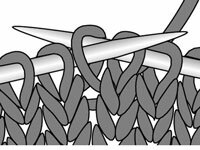 Insert your LH needle under the running thread between the stitch just made and the stitch designated as the center stitch, insert the RH needle from left to right through the lifted strand stitch, and knit as normal. 3Knit the next stitch as normal. This is the center stitch. 4Work an m1 that twists to the left. 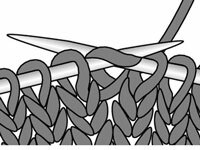 With your LH needle, pick up the running thread between the knitted center stitch and the stitch that follows it; then knit the lifted strand through the back.